Hope Locker is an innovative idea that finds a new opportunity for charities to engage with potential donors in everyday life. 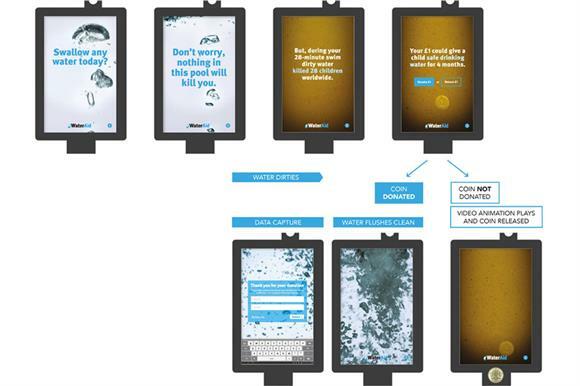 Developed by creative marketing agency Proximity London, it intersperses itself between a gym or swimming pool user and the £1 coin typically required to operate the changing room locker with the aim of appealing to their charitable instincts to consider giving it away. Proximity London is now attempting to move the systeam to commercialisation following a trial with WaterAid, the charity focused on obtaining clean drinking water in the developing world, and which described the results as "encouraging". Hope Locker 2016 from ProximityLondon on Vimeo. The trial was conducted in a swimming pool in Richmond, south west London, at the end of 2015 where a touchscreen display was installed inside at least one of the changing room lockers. Proximity commissioned production agency MediaMonks to rig up the display (in this case an Android tablet) to interact with the coin operation mechanism in the locker. When someone deposited their coin they saw it apparently dropping into clean water on the display, which carried WaterAid branding and presented the message ‘Enjoy your swim’. When the locker was reopened the message changed to ask "Swallow any water today?" In the next transition the text changed to "Don’t worry, nothing in this pool will kill you" as the water suddenly changed from clean to dirty. "But, during your 27-minute swim dirty water killed 27 children worldwide." The screen then told the person how their £1 could help and offered them a choice between donating it and getting it back. 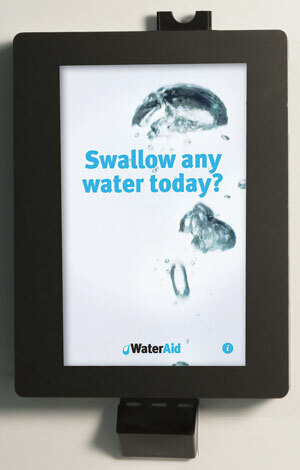 While Proximity and WaterAid declined to reveal how much money the trial had generated, Proximity said it had indicated the idea was commercially viable and as a result it was attempting to roll it out to other venues and it is open to other charities. It is not clear at this stage how much of each £1 donation can be expected to reach charities using the Hope Locker; Proximity said it was unable to answer because it was in sensitive legal and contractual discussions with media owners and clients. However, the call to action, with its clever use of context, deserves greater exposure and it will be interesting to see how the agency can adapt it to other environments and messages. Proximity executive creative director John Treacey said: "The Hope Locker really dials up the empathy, and our trials have shown this to be a powerful spur for donation." WaterAid’s special projects manager Charlotte Forrest added the charity is excited to see how it can be further developed. "I love this idea," she said. "It’s really different and innovative, and there’s a clear link to our vision and values as an organisation." 'The blind shall see - and you can watch': does digital storytelling raise more money for charities?